I have yet to read the manga or watch the anime but a quick research I did shows that the inspiration of JoJo's Bizarre Adventure can never be attributed to a single person or thing. 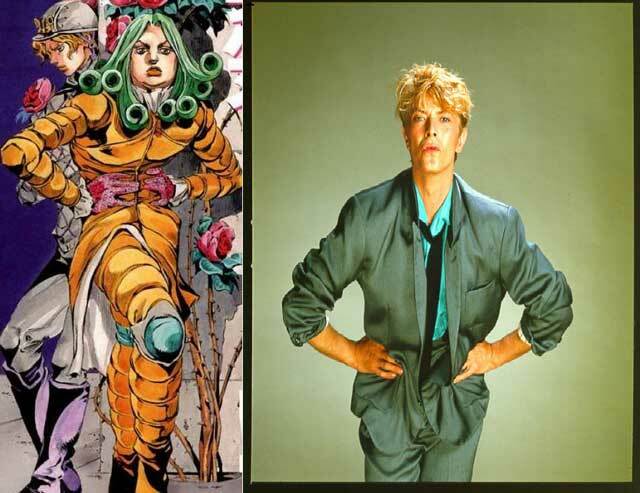 The three Bowian themes of pushing genre boundaries, creating unique and flamboyant aesthetic identities for characters and personae, and pursuing a degree of self-reflexivity can be found in JoJo, as themes at least indirectly inspired by Bowie’s artistic endeavors. In addition, you can see below one of the many comparisons done by the article of poses from one of the characters in the manga to a famous pose done by David Bowie. Aside from music, films also influenced the manga. In this article, Hirohiko Araki revealed in an interview how Blade Runner heavily inspired his creation. He said that Blade Runner's Roy Batty, as portrayed by Rutger Hauer, influenced the character DIO in his manga. In particular, he mentioned how Batty's short blond hair and muscular build influenced DIO.